27641 Private George Nixon Dent, 1st Battalion, the Grenadier Guards was killed in action 27 September 1918 aged 25 and is buried at Sanders Keep Military Cemetery, Graincourt-les-Havrincourt  and commemorated on the Butterknowle, Copley, Staindrop War Memorials and the St. John the Evangelist Church Memorial Plaque. 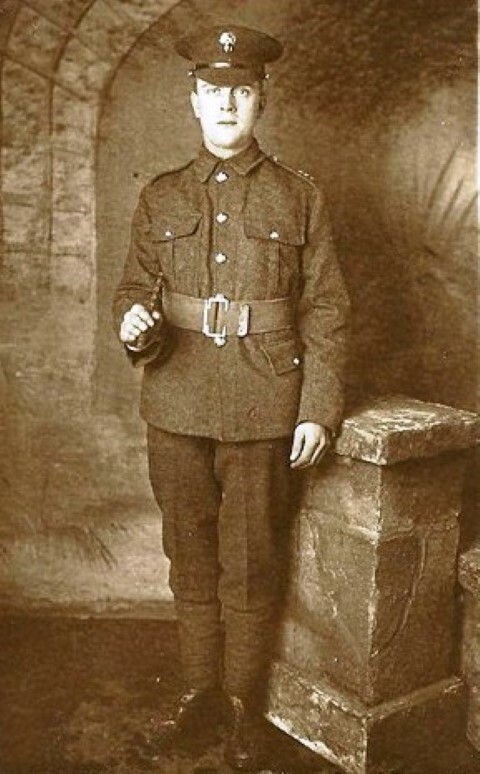 24 June 1916: George Nixon Dent enlisted aged 22 years 4 months. He stood 5’ 8¼” tall and was a Primitive Methodist. 4 November 1916: he was called up for service, posted the next day to the Guards depot at Caterham and given the service number 27641. 30 December 1917: he entered France and joined the Guards depot at Harfleur being posted to the 4th Battalion, the Grenadier Guards. 3 January 1918: he joined the Guards Reinforcement Battalion. 1 September 1918: he was transferred to the 1st Battalion. 27 September 1918: killed in action. The date of death, 27 September 1918 coincides with the commencement of the Battle of the Canal du Nord, 27 September – 1 October 1918. The 1/Grenadier Guards, as part of the Guards Division was with the 6th Corps of the 3rd Army. Crossing of the Canal du Nord opened up the Hindenburg Line and the Guards Division saw action near the village of Flesquieres, south-west of Cambrai. The part played by the 1/Grenadier Guards is notable for the award of the Victoria Cross to Lord Gort. 26 September 1918: the battalion left billets about 1 mile north-west of Lagnicourt and marched along the Lagnicourt to Doignes road to bivouacs west of Louverval Wood. The strength of the battalion was 15 officers and 395 other ranks going into battle. The area of land subject to the attack lay to the north east of the village of Flesquieres and south-east of Graincourt which was held by the enemy. The Germans held Beet Trench leading to the ruins of the former Beetroot Factory which was a strong point to the east of Flesquieres. The battalion was to attack Premy Hill with the object of securing the line of the sunken road (note: precise location to be checked on a map) and was made in conjunction with the 2/20th London Regiment who were to advance on Marcoing and the 2/Scots Guards who were to attack Leech Trench. Marcoing is a village which lies to the east of Flesquieres. The attack was to be led by No.2 Company on the right and No.4 Company to the left, followed No.3 Company in support at a distance of 500 yards in readiness to make a flank attack on Premy Hill from the north should it be necessary. No.1 Company was in reserve at a distance of 500 yards. Corps heavy artillery bombarded Premy Hill for 5 hours then lifted onto Nine Wood for 30 minutes then ceased. 27 September: under the cover of darkness, the battalion marched to the Cambrai to Bapaume road and at zero-hour, 5.20am advanced towards Flesquieres across country, via Demicourt. The battalion reached the Canal du Nord under shell fire and, since the canal was dry, scaled the eastern bank using ladders, 100 yards north of Lock Seven. The battalion had to be in position east of Flesquieres by 9.20am but the undulating ground was being swept by enemy fire from positions to the north at Graincourt some 4000 yards to the left. 2/Grenadier Guards was unable to advance on Orival Wood, north east of Flesquieres which had not been taken by the Third Division thus the 1/Grenadier Guards were unable to enter Beet Trench, north of Flesquieres. Enemy fire from the vicinity of Graincourt became very heavy. Lord Gort led his companies through the northern edge of the village (Flesquieres) through houses under fire from 2 enemy batteries operating from Beet Trench and the Beetroot Factory to the north-east. Lord Gort took the leading platoons of the 2 leading companies into position for assault being slightly wounded in the process. Second Lieutenant Clarke with his patrol platoon worked their way round the left flank of the enemy and captured the Beetroot Factory, taking the garrison as prisoners. But the platoon suffered heavily. S/L Clarke was then ordered to take a platoon from No.3 Company and attack Beet Trench from the rear. A tank appeared on the scene and Lord Gort went across open land to direct its attack. S/L Clarke and his men were successful in their assault on Beet Trench, capturing a machine gun post and drove out the Germans from Beet Trench into the sunken road where they surrendered. The 2 leading companies continued their advance, No.3 Company moved forward in support of the left flank and the Kings moved up to the sunken road in reserve. The enemy was shelling the neighbourhood of Beet Trench heavily and sweeping the whole area with machine gun fire. No.2 Company reached Labour Trench, leaving 2 platoons in support in Premy Trench but faced point blank artillery fire from Nine Wood and could advance no further. The enemy held the village of Marcoing on the right flank and a spur of Leech Alley on the left – the 1st Battalion drove into this line and held it. The positions were consolidated under heavy fire and Lord Gort was decorated for his part in the successful assault. The men, however, seemed disappointed that they could not push farther on. The Germans appear to have been thoroughly mystified by this attack throughout the whole operation, and to have imagined that the advance might eventually develop into a turning movement, threatening their line of retreat. When the Second Division came up at 2.30, they found the enemy retreating everywhere before them. As soon as the advance had been begun by this Division, the 1st Battalion was withdrawn to an area west of the Canal. The extraordinary success achieved by the Battalion during this attack was entirely due to the courage, endurance, and determination of Lord Gort, who was awarded the V.C. for his conspicuous bravery. He was able by his example and the reckless exposure of his own life to infuse into all ranks an indomitable determination to reach the objective, no matter what the cost might be. He had himself brought the Battalion to a very high state of efficiency, and there is little doubt that with a less highly trained battalion such an attack might have ended disastrously. Private G.N. Dent served a total of 1 year 328 days, including 272 days with the BEF in France. He was awarded the British War and Victory medals. “For most conspicuous bravery, skilful leading and devotion to duty during the attack of the Guards Division on 27th September 1918, across the Canal du Nord, near Flesquieres, when in command of the 1st Battalion, Grenadier Guards, the leading battalion of the 3rd Guards Brigade. Under heavy artillery and machine-gun fire he led his battalion with great skill and determination to the “forming-up” ground, where very severe fire from artillery and machine guns was again encountered. Although wounded, he quickly grasped the situation, directed a platoon to proceed down a sunken road to make a flanking attack, and, under terrific fire, went across open ground to obtain the assistance of a Tank, which he personally led and directed to the best possible advantage. While thus fearlessly exposing himself, he was again severely wounded by a shell. Notwithstanding considerable loss of blood, after lying on a stretcher for awhile [sic], he insisted on getting up and personally directing the further attack. By his magnificent example of devotion to duty and utter disregard of personal safety all ranks were inspired to exert themselves to the utmost, and the attack resulted in the capture of over 200 prisoners, two batteries of field guns and numerous machine guns. Lt.-Col. Viscount Gort then proceeded to organise the defence of the captured position until he collapsed; even then he refused to leave the field until he had seen the “success signal” go up on the final objective. Private G.N. Dent is buried at grave reference II.A.3, Sanders Keep Military Cemetery, Graincourt-les-Havrincourt. There are 135 burials in the cemetery including Lance Corporal T. N. Jackson 1/Coldstream Guards who was killed in action 27 September 1918 aged 21 and awarded the Victoria Cross. Sanders Keep was a German fortification on the Hermies/Havrincourt road stormed by the Scots Guards 27 September 1918. Private G.N. 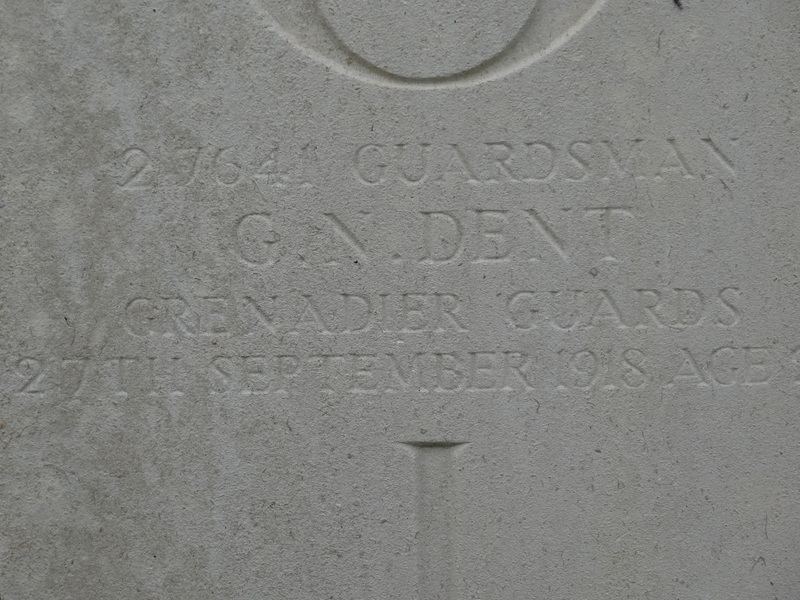 Dent is commemorated on the Butterknowle, Copley and Staindrop War Memorials and on the plaque in St. John the Evangelist Church, Lynesack.